Two absorbing solo exhibitions recently mounted in Virginia presented African-American artists looking at their ancestral ties to the Commonwealth: Nate Young’s re(collection) at the Visual Arts Center of Richmond, and Radcliffe Bailey: The Great Dismal Swamp at the Greater Reston Arts Center. Both presentations revolved around artists using their family stories for self-examination and as touchstones for broader African-American experiences, but there was even greater complexity at play. With overlapping yet distinctive strategies, their exhibitions spun stories around history, memory and experience, and questioned the possibility of ever “knowing” the past. Radcliffe Bailey and Nate Young both claim familial connections to Virginia, and explore the movement of ancestors who migrated from the South to the North. Bailey’s predecessors made the journey via the Underground Railroad, settling in New Jersey where he was born in 1968. When he was four years old, his family “reverse migrated” back south and settled in Atlanta, where he was raised and lives to this day. Bailey has ties to Virginia on both his mother’s and father’s sides, and made regular visits to his grandparents’ farm near Charlottesville (his grandfather worked at Monticello). Young was born in Minnesota in 1981, and now lives in Chicago. His family landed in the Midwest after his great-grandfather moved north during the Great Migration, passing through Virginia. A method shared by both artists is the mining of their family photo albums. Bailey reports that his grandmother gifted a large trove of photographs to him before her death, a collection that depicts relatives as well as African-Americans whose identities and relationships to the family are unknown. One such image appears in Bailey’s Travel by Night (2007), an oversized lantern featuring a 19th-century tintype portrait of a black soldier who presumably served in the Union army. Similarly, Young tells of the impression made upon him by a box of family photos discovered in his aunt’s basement. One photograph of his great-grandfather on horseback long fascinated him, prompting him to speculate if he was the descendant of one of the storied “black cowboys.” Although it was not displayed, that photo played a key role in his show. Installation view of Radcliffe Bailey: The Great Dismal Swamp at Greater Reston Arts Center. Left: Travel by Night, 2007. Glass, steel, candelabra, and photo emulsion, 60 x 36 x 48 inches. Right: Windward Coast - West Coast Slave Trade, 2009–2011. Piano keys, plaster bust, and glitter. ©Radcliffe Bailey. Image courtesy of the artist and Jack Shainman Gallery, New York. Photo by Elizabeth Board. Bailey’s exhibition title conjured the Great Dismal Swamp, the repellently named body of water that spans Southeastern Virginia and Northeastern North Carolina, where inhospitable terrain historically sheltered hidden settlements of freed and escaped slaves. While it is a region that had long interested the artist, it seemed somewhat tangential to the exhibition’s contents, a collection of works dated 2007 to the present, most previously exhibited. The only work on view explicitly connected to the show’s title was the painting, Up From the Dismal (2017), not originally intended for inclusion, but added post-opening after a lender recalled another piece. Bailey has stated that his artwork covers personal stories “with a coat of history,” but in this exhibition, the opposite felt true; the artist, a self-proclaimed “forever student of the then and now” seemed more concerned with history than explicit autobiography. The works are pastiches of various hallmarks of African-American and African-Caribbean experiences. Cash crops like sugar and cotton are placed alongside ships, ladders and railroad tracks, referring to Colonialization, the Middle Passage, the slave trade and Underground Railroad, and the Civil War. Young’s was a more responsive undertaking, a collection of newly created works (all 2017), inspired by place. The artist was in residence in Richmond, and made some of the pieces on-site in collaboration with local artisans. The entire project was a meditation on Young’s great-grandfather’s journey north. In a performance-like reading on the exhibition’s opening night, Young delivered the following details: in the early 1900s, his great-grandfather was jailed, for unknown reasons, along with three other African-American men in Virginia. After observing a Freemason ring on his finger, the jailer secretly freed him under the cover of darkness, sparing him from the awful fate of his cellmates, who were lynched. He stole a horse (upon which he is pictured in the treasured family photo) to ride it to freedom. Once safe, he reluctantly killed and buried the horse to dispossess himself of the incriminating stolen animal. Young goes on to report that, using documents inherited from his great-grandfather, he recently located the horse’s burial site, and dug up the remaining bones. Nate Young, Casting 1 – 5 (detail), 2017. Serigraphs with earth and graphite on paper. Five pieces; 48 x 35.5 inches each. Image courtesy of the artist and Monique Meloche Gallery, Chicago. Made in collaboration with Travis Robertson. The two main narrative components of Young’s story—ring and bones—became literal subject and material in his work. He cast a replica of what his great-grandfather’s ring might have looked like in 22k gold, and displayed it atop an elaborate wood pedestal with a hinged top (Young is a master woodworker, hence the material played a starring role throughout the exhibition), assigning the title, Reliquary for an Imagined Family Heirloom. 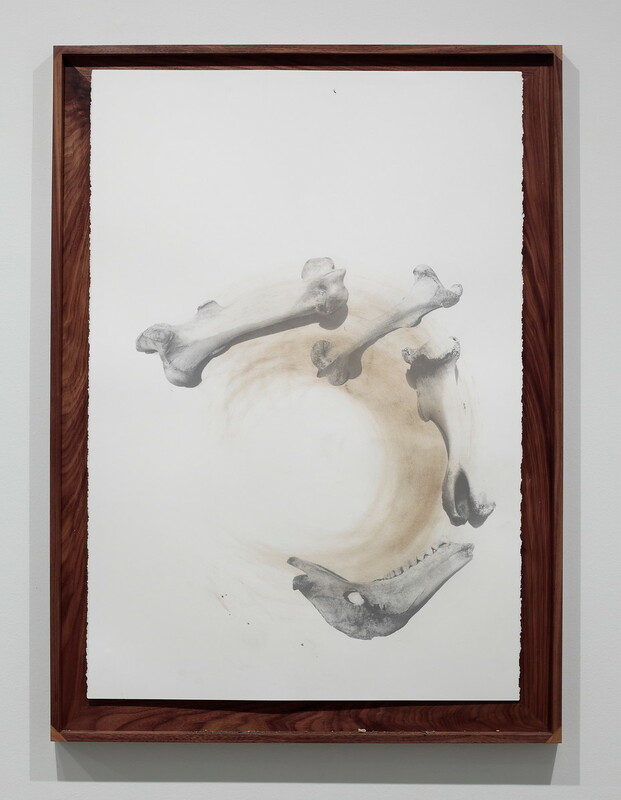 A series of prints depicting scattered horse bones were literally soiled; dirt had been rubbed into the paper and allowed to settle on the bottom edges of the beautifully crafted wood frames. The earth was sourced from Richmond’s Church Hill neighborhood, specifically from the site of a collapsed underground railroad tunnel. The exhibition was rounded out by the installation, Attempts at Seeing. 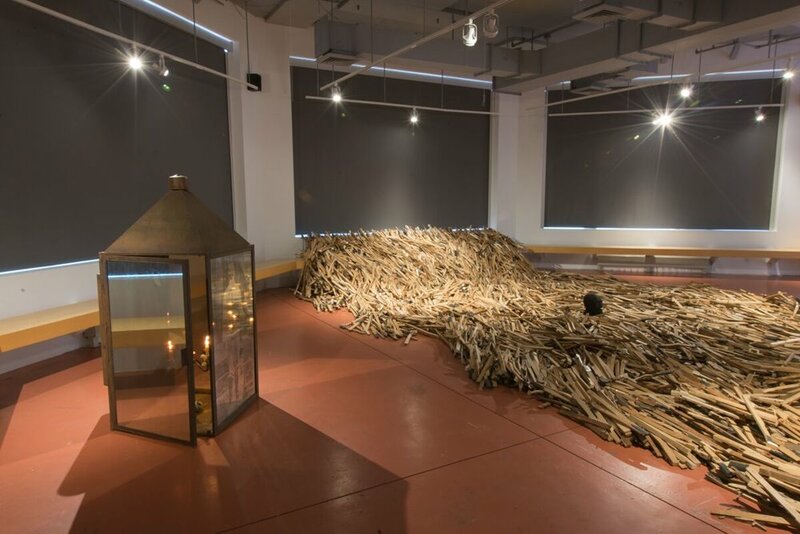 Viewers passed through a curtain to enter a dark and seemingly empty space, only to encounter the occasional flash of spotlights illuminating discrete collections of horse bones placed on wood plinths around the room. These flashes were synched with the recorded sound of the bones falling to the ground. The sound and light were so brief and startling in their delivery, viewers’ comprehension of what was in the room resolved only in post-experience cognitive processing. In other words, as an after-image. Nate Young, Reliquary for an Imagined Family Heirloom (detail), 2017. 22k gold and walnut ring: 5/8 x 1 x 1 inches; Reliquary: 45 x 8.5 x 8.5 inches. Image courtesy of the artist and Monique Meloche Gallery, Chicago. Made in collaboration with Jay Sharpe. Unexpectedly, these two artists who grapple with weighty histories share inclinations to champion hope over despair. The centerpiece of Bailey’s exhibition was Windward Coast – West Coast Slave Trade (2009-2011), a sprawling installation in which heaps of piano keys cascade to form a virtual sea, enveloping a lone, glittery, monochromatic black head. Removed from their normal context, the piano keys were so uncanny they were almost unrecognizable, more closely resembling the splintered wood of torn down shacks than components of a musical instrument. Bailey reports that the piece, which has been shown various times since its creation, adopts different meanings depending on the context, for example, eliciting a storm surge when it was shown in post-Katrina New Orleans. Given the exhibition title’s reference to the Great Dismal Swamp, in Reston it seemed once again to suggest the fragility of human life when confronted with overwhelming forces. The head at its center seemed in perilous danger, about to be swallowed and swept away by the current. Yet, Bailey insists that from his perspective, the work is not so bleak; he associates it with childhood memories like fishing with his father, and a local piano shop where old instruments were sometimes stripped. He ruminates on the DNA the piano players deposited on the keys through the process of making music. For him, music itself is akin to DNA; a strand of building blocks that unites tribes. Radcliffe Bailey, Windward Coast - West Coast Slave Trade (detail), 2009–2011. Piano keys, plaster bust, and glitter. ©Radcliffe Bailey. Image courtesy of the artist and Jack Shainman Gallery, New York. Photo by Elizabeth Board. Young’s sound and light installation also felt somber and serious, using darkness to disorient and then startle with its lightning flash of sensorial experience. But Young reports that his approach to the space was as conceptual as phenomenological; he wanted to wield darkness as a stand-in for a theoretical or paradoxical space that cannot exist. Inspired by “Blackness and Nothingness,” an essay in which scholar Fred Moten argues the case for “black optimism,” Young believes in increased possibilities, not just in the face of challenges, but because of them. A well-lit room has clear dimensions and therefore limits, but a room that’s dark is potentially infinite. Radcliffe Bailey, Conductor, 2016. Mixed media including collage elements, paint, and glass on panel. ©Radcliffe Bailey. Image courtesy of the artist and Jack Shainman Gallery, New York. If Bailey flits around like a rabbit who can’t be caught, Young takes a deep dive, straight down the rabbit hole. His stories about his great-grandfather are unquestionably dramatic, although perhaps not entirely implausible, especially if one subscribes to the notion that truth is often stranger than fiction. Even so, there is little doubt that Young is “mythologizing” his family story, to use the words of the exhibition’s curator. The text read by the artist on opening night wove in excerpts from Umberto Eco’s Foucault’s Pendulum, a book that nurtures conspiracy theories including the supposed link between medieval Knights Templar and modern Freemasons. While people often want to know if his family story is factual, Young sidesteps this desire for confirmation with, “I’m less interested in if it’s true, and I’m more interested in if it’s real.” Unlike Bailey, Young doesn’t identify with the Trickster; he is inquiring how the veneer of authority or accuracy is assumed by certain objects, framing of ideas, and types of language. Like Bailey, he respects the power of mythology. In his studies on the structure of mythology, Claude Lévi-Strauss wrote "Mythical thought always progresses from the awareness of oppositions toward their resolution." But when it comes to understanding history, the lives of others, and the opposition of experiences, there is no resolution. Only through reconstruction, reframing, and reconsideration of others’ experiences—as well as a critical examination of our own subjective lenses—can we begin to process the past. As with Young’s strobe-lit bones, most of the time, we can only glimpse an after-image. Nate Young, Attempts at Seeing (detail), 2017. Light, sound, horse bones and walnut. Image courtesy of the artist and Monique Meloche Gallery, Chicago. Nate Young, (re)collection, guest curated by Melissa Messina, was presented at the Visual Arts Center of Richmond, April 21 – June 18, 2017. Radcliffe Bailey: The Great Dismal Swamp, guest curated by Holly McCullough, was presented at the Greater Reston Arts Center, April 21 – August 18, 2017. Lauren Ross is a Richmond-based curator and writer, and the founder of RVA Critical Art Writing Program. She has served as a curator at various cultural institutions around the U.S., including the Institute for Contemporary Art at Virginia Commonwealth University, Philbrook Museum of Art and the High Line. Her writing has appeared in exhibition catalogs published by Dallas Museum of Art, The Studio Museum in Harlem and the Whitney Museum of American Art, as well as in periodicals such as The Art Newspaper, Art in America and The Brooklyn Rail.